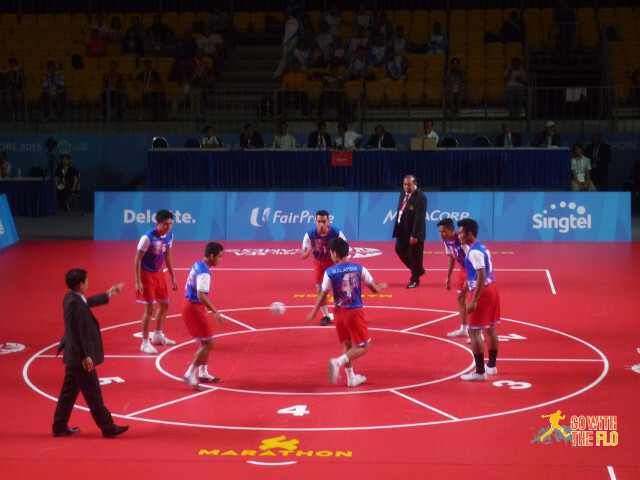 Sepaktakraw differs from the similar sport of volleyball in its use of a rattan ball and only allowing players to use their feet, knee, chest and head to touch the ball. 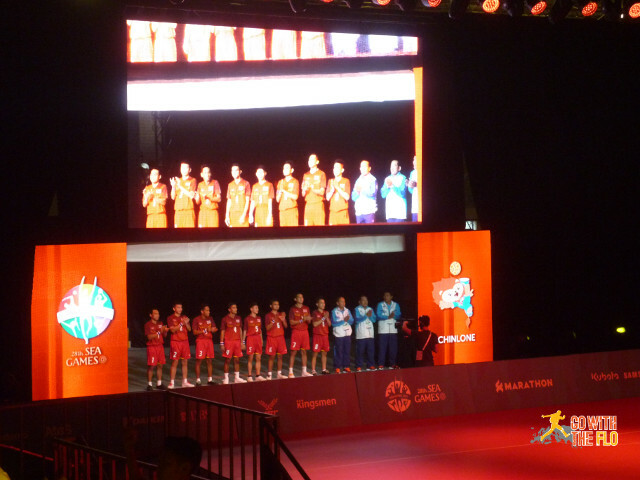 So we got tickets for that and drove out to Singapore Expo where the event would be hosted. Again, security was very tight with metal detectors. 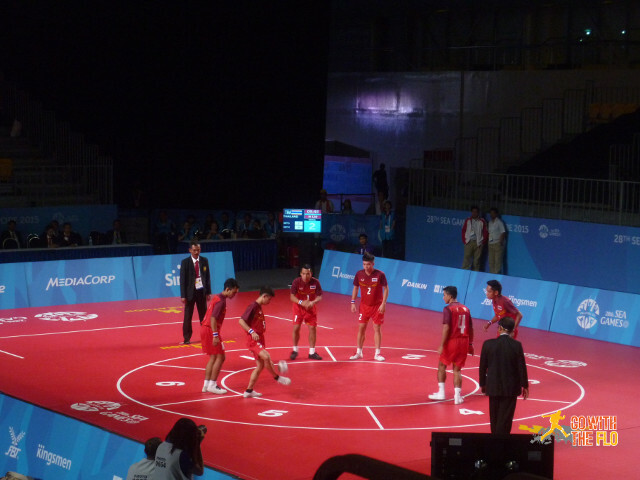 Not sure what kind of crowd Sepak Takraw normally attracts. When we were there it barely attracted anybody. We specifically went for the final of the day, but even then, it was hardly 50 spectators and we soon found out why. Turns out there are different disciplines of the sport. 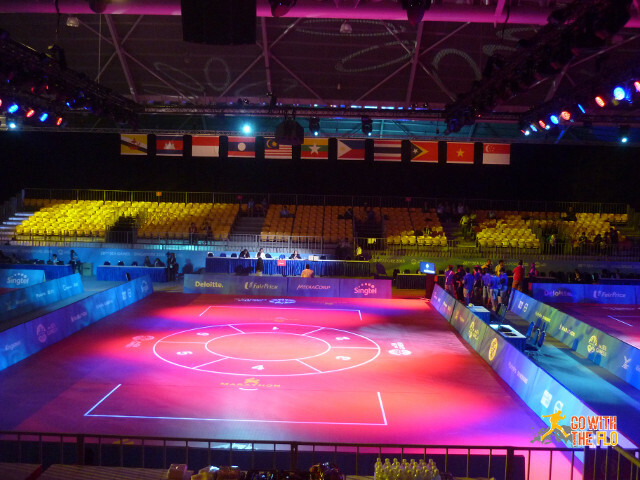 There is a action-oriented, competitive version where you drop kick the ball over the net (which is what we wanted to see). And then there is the not-so-competitive variant called Chinlone (originating in Myanmar) that we happened to catch. Remember playing hacky sack in high school? Was kinda fun, right? Remember watching others playing hacky sack? No? Right, because that was boring. Yea, so Chinlone consists of two team separately passing the ball in a circle with the team winning that can complete more circles in 2×10 mins. 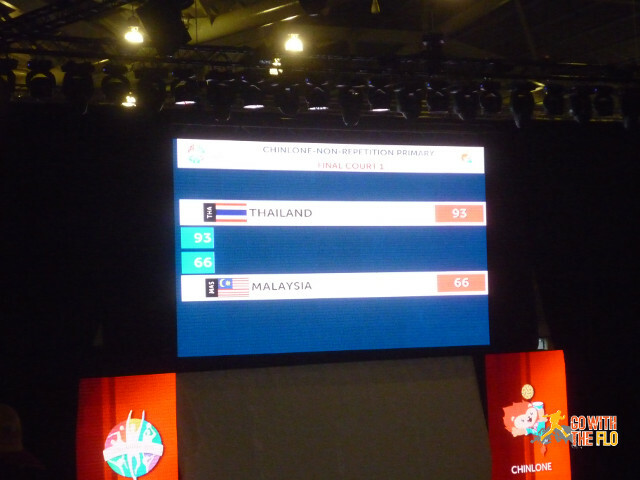 Long story short, Thailand dominated the final against Malaysia and won 264-200. …in a game which was very clear from the beginning. 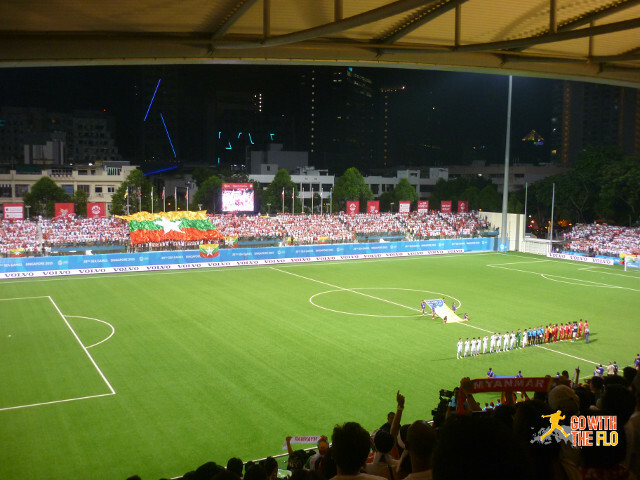 Time was running out until the kick-off to the big football game at 8.30pm so we hopped into a taxi over to Jalan Besar Stadium. 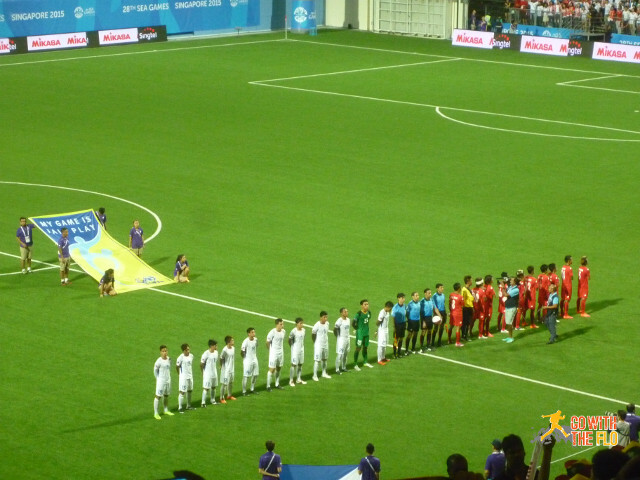 With Myanmar playing, we expected a full house and were not disappointed. 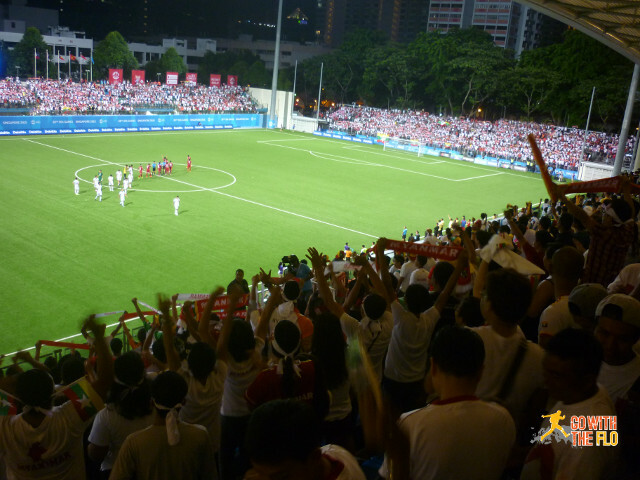 In fact, it was so full that the stand that we were booked in was full already and we were directed to another stand. 80 minutes into the game, some fans started going around with big plastic bags collecting the trash. Really? Yes, really. I wouldn’t say the stadium was spotless when we left it, but quite close to it. 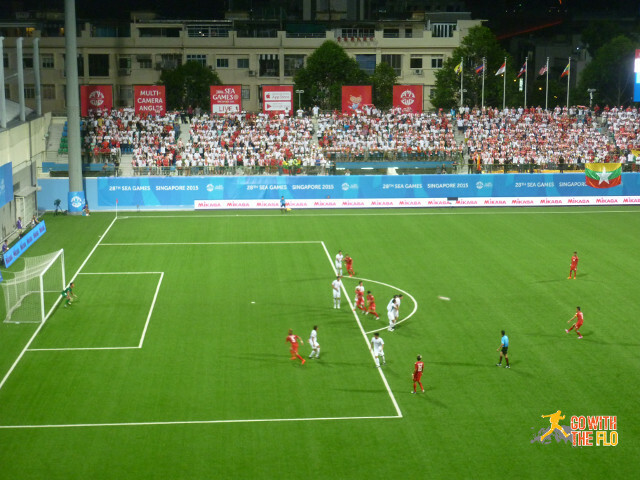 The game’s over – 5-1 Myanmar! All in all a great evening. 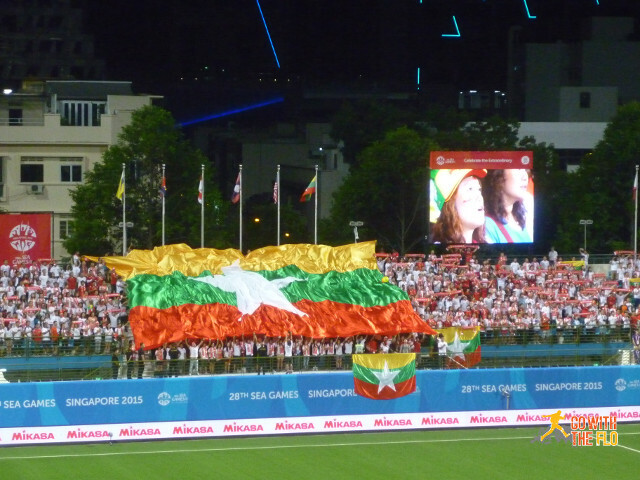 While we’ll probably give the next Chinlone sessions a pass, we bought tickets for Myanmar’s last group game against Cambodia.